Slave to the rich, rude and deluded, cosmetic surgery receptionist Serenity Holland longs for the day she's a high-flying tabloid reporter.Unfortunately, every pitch she sends out disappears like her clients' liposuctioned fat, never to be seen again. Then she meets Jeremy Ritchie --the hang-dog man determined to be Britain's Most Eligible Bachelor by making himself over from head to toe and everything in between -- giving Serenity a story no editor could resist. With London's biggest tabloid on board and her very own column tracking Jeremy's progress from dud to dude, Serenity is determined to be a success,even going undercover to gain intimate access to Jeremy's life. But when Jeremy's surgery goes drastically wrong and Serenity is ordered to cover all the car-crash goriness, she must decide how far she really will go for her dream job. 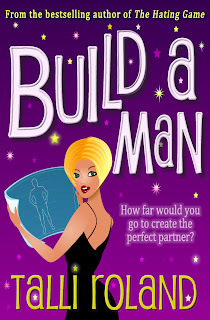 Build A Man was a delightful book for me to be introduced to Talli Roland's writing talents. A light and charming read, I found the main character, Serenity Holland, to be reminiscent of the loveable awkwardness of Bridget Jones. And we all have felt like Bridget, or in this case, Serenity, at some point in our lives. The book begins with Serenity living a lie. Well, maybe not a lie but she's definitely living in a situation where she feels stuck and not happy. Aspiring to become a tabloid journalist while working as a receptionist for her boyfriend's plastic surgery clinic, Serenity is the complete opposite of her name. From a rigid, unthoughtful partner who treats her more like an employee than a girlfriend, to dealing with her best friend's pregnancy and engagement, Serenity is already a bit overwhelmed before a shot at making it in her dream job comes along. But against all odds, she takes the chance and goes for it. Documenting a patient's progress and foray into the plastic surgery world all while being undercover and beginning to care about him is a sure recipe for awkward Serenity's mishaps. This book had me laughing and cringing at times and it definitely had me identifying with her feelings and also her trouble realizing what they were. For a great read with a very human, realistic heroine of sorts that could be any of us, I'd definitely recommend Build a Man. Thank you to Talli Roland for our review copy. All opinions are our own. Great review of a terrific book! !